Absolutely no art experience is required. Paint your favorite furry friend or make a great gift with an exclusive pet portrait on canvas! Expert animal portraitist, Jana Komaritsa will be your guide. 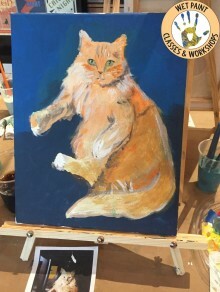 Working from a photograph of your pet, you’ll learn a simple way to transfer the image outlines to the canvas, some basic color mixing and brush strokes in acrylic paint. All pets are accepted! All materials will be provided. No experience required! Please email Jana a photo of your pet immediately after registration, so that we can prepare it for you to trace onto canvas during the class: komaritsa@gmail.com Deadline for submitting photos: 24 hours before class start.